She said that “Still Face Experiment” was hard to watch, and she’s right! The “Still Face Experiment” has been around since 1975, when Drs. Ed Tronick, T. Berry Brazelton and two colleagues presented it to the Society for Research in Child Development. (Jason Goldman did a great writeup on Thoughtful Animal about the experiment, the impact it had in understanding child development, and how it’s being used, including to predict child behavior.) Since this YouTube video of the experiment was posted in 2009, it’s been watched more than 760,000 times. Tronick is director of UMass Boston’s Infant-Parent Mental Health Program, among many other activities, and he does research on how mothers’ depression and other stressful behaviors affect the emotional development and health of infants and children. This video became particular poignant when I saw these two recent stories — First-time parents ‘graduate’ into the role, and Cuyahoga County’s at-home baby visits are priceless, but face cuts. The first story, by Tiera N. Wright on MassLive.com, focused on a parenting program in Springfield, MA, in which 73 parents are enrolled. Called the Healthy Families of Greater Springfield, the program is overseen in the state by the Children’s Trust Fund and provides home visiting for first-time parents under age 21. Parents are eligible for these support services during pregnancy and until their child is three years old. A federal grant awarded this June enables first-time pregnant, or parenting moms to children under one, of any age in Springfield to be admitted to the program through the Massachusetts Home Visiting Initiative. There are separate home visits for dads if the child’s parents are not together. 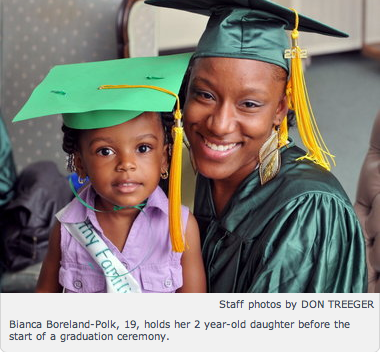 This photo of Saniyah Polk, 2, and her mother Bianca Boreland-Polk, 19, says it all. That kid has had a very engaging-faced mom in her face, don’t you think? btw, the Home Visiting Initiative is part of the Affordable Care Act. 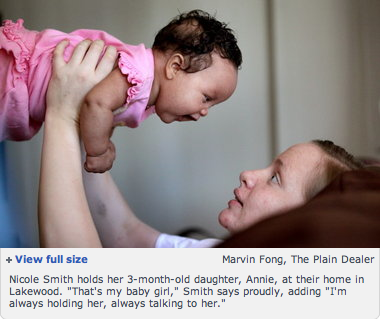 In the second story, Cleveland.com reporter Sarah Jane Tribble looks into the Newborn Home Visiting Program, a free service offered by Cuyahoga County Invest in Children for 2,000 participants in Cuyahoga County. When it was available for “any new mother who wanted an at-home checkup with a trained nurse,” the program served 8,000 people. But that was before the state cut all support for the program — $1.36 million. Now the program is just for those designated the most needy, and the county pays the $453,000 bill. At its core, the program is simple: A nurse visits the family at home within days of the new baby and mother being discharged from the hospital. The nurse has been trained to check the environment to make sure it is safe for the baby. She talks to the mother about making certain that the infant is sleeping on his or her back to reduce the risk of sudden infant death syndrome. She also checks the baby’s weight and the baby’s developmental health by making eye contact and ensuring that the baby is able to grasp an offered finger. The nurse checks the mother’s blood pressure and her frame of mind. Nurses watch closely for signs of postpartum depression or other mental health concerns. Making sure mothers and fathers are actively engaging with their infants — i.e., not doing “still face” — is an important part of this service. If mom’s or dad’s (or whoever the main caregiver is) depressed, s/he’s unlikely to be having much positive emotional interaction with the infant, whose developing brain will begin to suffer the consequences if that’s not reversed. The consequences are grim, and the rewards to ensure a healthy first three years of growth are better than the stock market in its good days. Early-intervention initiatives such as the newborn visiting program and quality preschools promote high school graduation and college attendance and have been shown to reduce the number of kids who end up in the criminal justice system, according to a number of medical and psychological research papers that have highlighted the correlation between early-childhood care and success later in life. In 2007, James J. Heckman of the University of Chicago published a paper that further supported the value of such programs, by showing that society reaps financial advantages when a child’s early years are improved. After following children from one preschool for 30 years, Heckman found that the estimated return on each dollar invested was 16 percent when accounting for reduced remediation, lower crime and increased earnings for the children later in life. There’s another aspect of “Still Face” that educator Rick Ackerly brought up earlier this year in his blog, The Genius in Children. He says this experiment may be showing the frustration of a baby’s loss of power (or agency), not just attachment. « How children (don’t) succeed; a program that helps them succeed; should these studies be ACE-informed? The Still Face Experiment youtube is one I frequently use in the classroom to help students understand the effect that addiction can have on children. I ask students to imagine what the face of mother looks like when she is hungover, craving, waiting for the phone to ring to know she has scored, consumed with guilt because of her using more than intended, or any of the plethora of negative emotional states that arise due to addiction (being an addict or living with someone who is). Students are usually stunned and overwhelmed by this experience as they imagine what the child’s experience would be in an atmosphere that consistently included addiction. As a result, many students who are recovering addicts and parents become highly motivated to learn skills that can help them optimize the lives of their children. Very interesting! Where do you teach? What age students? I teach at Portland Community College where we have an Alcohol and Drug Counseling Program. We are currently adding the trauma material across our curriculum. Our students range from 16 year olds to 70+ year olds. The State of Oregon has required that Trauma Informed Services be part of state funded addiction/mental health services but they have not added much to the resource side or training side of the equation. I have developed a training that looks at the effect childhood trauma has on the developing brain (in particular the stress and reward system) and how this results in an increased propensity for addictive behaviors.